Freecaddie + Red Shipping + Apps + Fiesta! Freecaddie for Android launches Pebble support! For those excited to venture out onto the course after a nice long winter, have we got the app for you! Freecaddie recently announced version 3.0 of their Android app, featuring Pebble connectivity. 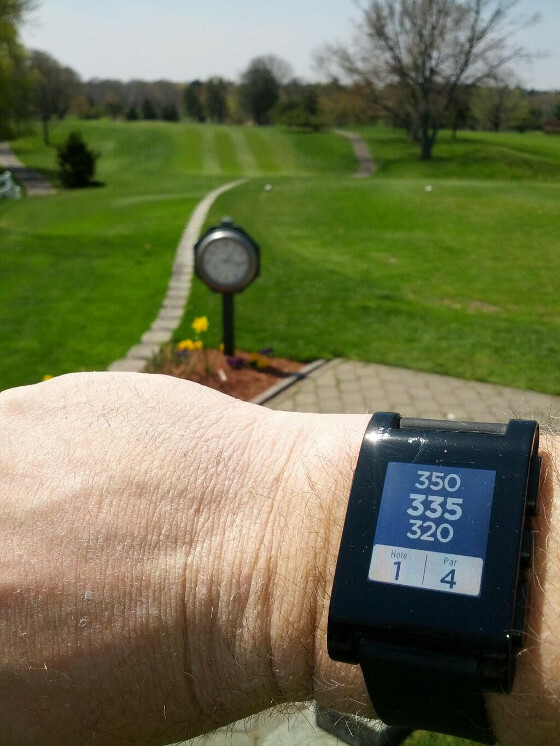 Freecaddie uses the GPS on your phone and lets you view the current distance to the hole on over 28,600 courses around the world...and now you can view those stats on your Pebble! We've been informed that iOS Freecaddie support is on the way. Finally, some good news about colors :) Last week, we started shipping the first Red Pebbles. We've nearly finished manufacturing 6,000 Red Pebbles, so many more will be flowing through our shipping system soon. Thanks for your patience! Orange will be the next colour to come out, followed by Grey and White. As we mentioned in a previous update, if you would like to switch from a color Pebble to Black, you may do so at anytime on account.getpebble.com. We've shipped out the first batch of back-to-black shipments from immediately after the announcement, and on a weekly basis we'll ship out any new Black changes. Apologies for not keeping ispebbleshipping.com updated. Throughout the switch to colour manufacturing and the back-to-black shipments, tracking has become a bit more complex. We launched the Proof-of-Concept Watchface SDK three weeks ago. The results have been astounding. Our forums have been buzzing with developers sharing their work and getting help navigating the entertaining build system that is waf. Over 500 watchapps have been published to a community-made site called mypebblefaces.com and our records show over 200,000 watchapps have been installed on Pebbles worldwide. At first, iOS users were unable to install watchapps but an update to our iOS app fixed that! iOS users, please make sure you have the latest version from the App Store (1.0.6). After that, you can browse to the various sources of pbw files on Mobile Safari and download them directly onto your watch. 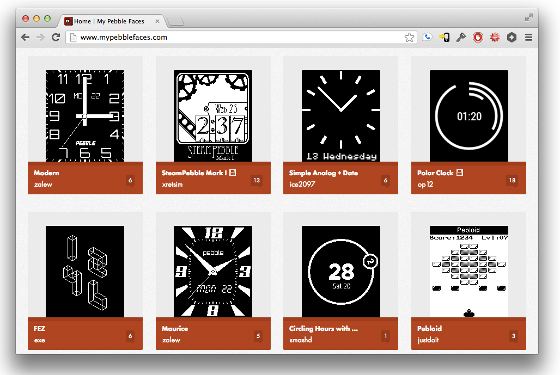 Want to create your own watchface, but your programming skills aren't up to snuff? 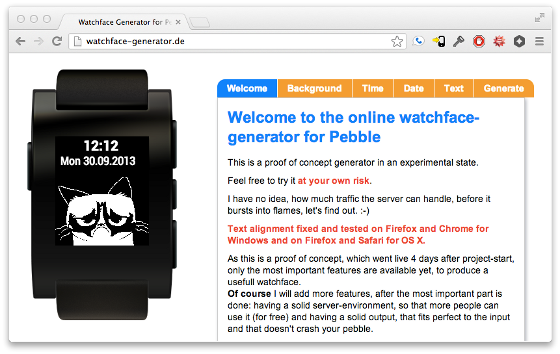 Try out the awesome watchface-generator.de website, courtesy of @prode81. Remember that Pebble only displays black-and-white on its 144x168 pixel screen. If you haven't checked out mypebblefaces.com in a while, we certainly recommend a look :) There are hundreds of watchfaces and watchapps available for Pebble. Try searching by 'most downloaded' to see the current favourites! UPDATE: mypebblefaces.com is overloaded with requests. You can find the watchapps referenced below on the Pebble forum here. We'll be launching limited 2 way communication in the next update of the SDK (within a month). This will enable apps to receive and transmit arbitrary data back and forth to the phone (for example, upon a button press on the watch). To make use of this feature, you will need to write an Android or iOS app as well as a native Pebble SDK app. Unfortunately, iOS apps that use this functionality may not be published to the app store at this time (Android apps may be published to Play Store). If you happen to be in San Francisco on May 16 (maybe for Google IO? ), we'd like to invite backers to a small get-together to celebrate 1 year since our Kickstarter project closed. To request an invite, please log onto your Pebble Account and follow the instructions. Please only request an invite if you will be in the area, thanks! Don't worry if you aren't able to get a ticket, this is just the beginning of our meetup plan. For example, a Pebble Users Group (PUG) has already popped up in Silicon Valley, check out the next meetup on May 22 at the Hacker Dojo in Mountain View. Anyways, that's it for this update. Thanks Pebblers! I payed for a black and a red pebble. I only got the red one ?!?!?!. No answers on my mail. I am tired of waiting. Who can help me to solve this problem to get also my black pebble as soon as possible. Maybe we should organize ourselves and start a lawsuit. --Make sure latest version of SW is installed on your Android phone and the watch. --Make sure that you have a slot open for a new app/face (didn't realize that this is why you can REMOVE faces). --For some reason, I don't get the prompt to open new faces with my default Droid browser, but I get the prompt in Firefox. Will Mypebblefaces support Android any time soon? WANT. I am very disappointed with my Pebble. Mine has stopped working in 6 weeks since it arrived. I hope someone can help me! Is it possible to have the coloured pebbles shipped at once because i appearently have to pay 10€ processing fee per shipment so if i get 5 shipments i'll have to pay in total about 65 $ processing fee. Used the freecaddie app on Monday, it was voted as the mvp of the round. Awesome. Why can I only switch to Black and not to red? I've been waiting for two things for at least a year, Bike Share in NYC and my Red Pebble Watch. It's been fun to wonder which I would get first, now they are neck and neck! Bike Share was delayed twice and you all know the Pebble story. Bike share launches "sometime in May" and If I get the watch on the same day it's going to feel like my birthday x 20! I really wish people would relax about not getting their pebble soon enough. >You have made your point, but cant make them as fast as they would like. RunKeeper just released update to support Pebble!! So if the red pebble is shipping where is my confirmation? this is really getting to be a problem...so many people with issues. Payed for the color tier and while it's great you guys added the ability to switch to black, a $10 refund is nice, I pledged the color tier while the early bird special was still available thinking I'd want grey from the renderings. After seeing the Final Colors in update #25 though I instantly had buyers remorse. The grey just didn't pop like it did in the rendering. I am considering switching to black but was holding off to see if you'd allow us to switch to any other colors. I hope you guys do. There's a workaround for iOS so you can get mail notifications. All you have to do is add a VIP mail recipient (google it if you don't know how to do this) and turn OFF VIP notifications (as well as turning ON regular mail notifications just the same as the instructions for messaging you followed when you set up your pebble. It works! People need to learn that Kickstarter isn't a damn pre-order service. You're paying funds to a company/idea to help them get off the ground. The pebble itself is a byproduct of this. I backed a Grey, so I'm still waiting. Waiting patently. Like an adult. These comment sections drive me insane. Pebbles are getting hit with VAT charges in the UK!!! Nice to see another kickstarter picking there pebble at the same time. But £26.06 Ida lot royal mail handling charge is £8 of that!!!! And the fact we did not buy a pebble but it was a reward if they got funded!! then, change our colors to black. wants only to run with watch. Ordered and Black Pebble...then bought into the Grey model...since went back to Black when the announcement went out about the "surplus".... going on 4 weeks and still waiting on "processing shipment." Sooooo. WHAT IS IT PEBBLE????????? Could you please make up your minds...but hey, THE RED PEBBLE IS SHIPPING!!!!!! Been more than one year noe since I bought 2 pebbles. 1 black and 1 white... The white one I don't even have an ETA. The black pebble was sent on MARCH 23rd and hasn't arrived to me. The status is the same one since I got the tracking number. I tried to post a comment, to e-mail them but I just keep getting ignored. And as I accessed pebble forum I just got even more frustrated cause I was able to see more people on the same condition watchless and dealing with a company that seems to not care about their custumers. What about RunKeeper for iOS? Been a year since I bought 2 watches and haven't seen one yet. Very difficult to be considerate. wowser! Sounds like a bunch of people mistakenly typed in 'kickstarter' instead of 'amazon' .com a year ago. Look forward to my grey pebble. Good luck with the manufacturing challenges. If nothing else you've provided the Petri dish for a fascinating social experiment for the past year. Loving my Pebble but not living up to the potential as it was advertised. Hope given more time, issues will be iron out. Please iron out the notifications issues with iOS mail. Each time there's no BT connection, I have to reset the darn settings. Now I coudn't be bothered. And where's Runkeeper app for Pebble? Take a look through the watch faces - there is a simple countdown timer. I used it on Saturday as sailing racing start watch (when my sailing watch battery died unexpectedly) and it worked a treat. I've had my Pebble (switched from orange to black) for about two weeks now. I've been happy with it; looking forward to the SDK officially coming out, and email support fixed for ios. I can imagine that it would be extremely frustrating for those of you who switched to black and still haven't gotten your watch yet. While I believe I've gotten really good email support and communication through out this process, it appears that others haven't been so lucky. They're a small company that wasn't built to handle the number of orders that they got, so we're all beta testers. Hopefully they'll start talking to frustrated people here and taking care of them as everyone who wanted a black watch should have one by now. Just got mine. Super excited. I'm lucky in that I've got my pebble, although I am disappointed that I have to reset my notifications each time the iPhone and watch are separated.... That's irritating. It's kind if not as advertised. Red pebbles now shipping? I switched from red to black because the black was supposed to ship right away and the red was supposed to be delayed and delayed. Well, guess what's been delayed? No pebble of any kind on my wrist. Maybe should have waited for the red? 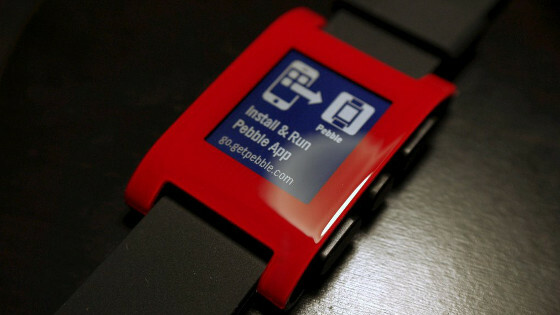 I am so disgusted with PEBBLE I could puke! I first backed a color Pebble, then got word that the color ones were taking a very long time to make, but if I wanted a black one, I could change my mind and get one of those within two weeks. Well, two weeks has come and long gone and STILL, I have no Pebble of any kind, nor any word whatsoever from the Pebble peeps. This is totally unacceptable, and I don't want anyone to tell me "but you're part of history, having been an early backer and all that..." BULL! What's the deal!? What I really want now is to get a RED PEBBLE ASAP, now that I see they're shipping. What's the chances anyone who gives a hoot will see this and respond? Hey my pebble programmers if it is possible one of you should make an app to force ring a silenced phone from the watch! just an idea. Also I think many people would be willing to pay 1$ for it easy. I love my black pebble watch and I can not wait when additional apps are released throughout the year. I see that some backers are having a problem with the pebble watch not working right or just broken. so you try and email pebble support but just can not get any help. so I say if you have a problem and you can not get any help and are getting real mad. then let your anger loose and post your comments on every site you can find like this one http://gripevine.com/. if you can put a video of your watch problem on utube and just tell every one how pissed you really are. Will never buy from this company again. 1 year celebration? You should be ashamed. Put on a celebration and not have your watches on wrists and not replying to bricked watches emails, I hope your hors d'oeuvres tast like small cat turds. Woof. Apple, Google and Samsung will likely have their watches on the market by the time I get my Pebble. One year celebration for closing of the Kickstarter project on the 16th of May. Please send my my watch so I can celebrate with you. If enough people do it, they might change their minds. And Apple may force pebble to have better customer care and not avoid there customers! The insult to not getting my watch or them not responding to my emails, and Facebook messages is they send me a Kickstarter backers guidelines, really kick start and pebble need a class action law suit, once and for all, these posts are upsurd, and it's one lie after another. And frankly there are more pissed off consumers and there now should be some attorneys plotting there remidy for so many people who have lost there monies to Pebble, kick starter boast this is one of there highest success, bit of course because kick starter makes Money, however what is the point if we all never get our products! Kick starter I will NEVER use you all again! Further all buys should be aware of these swiny swindling practices of BS posts on when your watch is coming! Here a post, your never getting it, and based on a the google searches the people who have gotten there watches are pissed, because there defective! Again your better off cutting losses and joining in a class action lawsuit at least there reputation will further help other consumers for loosing there money! If I get another posting from Kickstarter or pebble of what the rules are about how I purchased and that they don't give you'd back your Money and it could take longtime, who cares, just refund me my money, surely after the millions you raised it won't hurt you to process one refund and save me the aggravation of complaints! I lost my charging cable weeks ago and tried to get an new one 4 times on different ways...but now answer. Please post a possibility to purchase one. I received my Pebble in February without a functioning backlight. Multiple contacts to Pebble have resulted in one response asking for a photo of the Pebble. Photo was sent weeks ago and I have yet to receive another response from Pebble. Worst customer service of any company I have ever delt with. I was an early backer, they have my money and I have a non-functioning Pebble. I now consider this theft. somebody noticed that the update is only signed by "Team Pebble", not with Eric anymore. Maybe they find the guy holding up the production. Still waiting for my back-to-black "stucking forever" pebble. And one more thing. Guys, you're not stupid, you managed to create a watch concept, case design, PCB design, you selected components, created all that renders and videos. But please tell me, how, how you managed to screw up things that much. You had best ever Kickstarter campaign, enough money, huge community support, free and massive advertisement in all tech and even not tech media around the world and you destroyed all of this by lie and luck of communication. Tell us the true, all your problems, and we will wait for our watches and buy next models in the future. Or keep doing like now and you will be recorded in history as company of one product, huge disappointment, false promises and destroyer of a Kickstarter's business model. Useless update. Nothing new except new lie. If we assume that info about production and shipping in this update is true, than this means that all previous production and shipping updates was lie. And because all previous updates are lie, why this one is different? So, this update is lie as well. About ispebbleshipping.com. If Pebble team can't handle such simple operation as tracking number of produced and shipped watches, then how they can run business at all? Or, if they do track all production and shipping, how they can create an SDK, if they incapable of displaying simple chart of producing and shipping of 5 different items?